State Bank of India offering New Bank Saving account opening through online, Today we discussing about how to opening SBI Saving account online, and explain the step by step procedure for applying SBI Saving account through online.State Bank of India Providing (State Bank of India online saving account opening form) easy steps to process for opening saving account through online .State Bank of India aims to avoid the long ques for opening New saving account and Save the customers time. SBI Providing lot of services through online like as SBI Instapay -(Mobile/ DTH Recharge, Utility bills etc.) Tax payments,Smart-Pay out Card, State Bank Virtual Cards, E Annuity Deposit,Block ATM Card,Internet Banking on mobile, SBI Flexi Deposit , Fund Transfer, IMPS payments , E-Recuring Deposits , E-Tickets Online SBI Account Application, Mutual fund investment, SSC and UPSC Online Fee Collection etc.Who want to open they Bank saving account at State Bank of India, those person can avail (Online SB Account Application ) these service for opening SB account in easy way. follow below given instruction and open online saving Bank account for resident individuals. Select "Apply SB Account" > Resident individuals > Regular SB account in the top Menu bar for opening "Online saving bank account application" for Resident individuals. You can Find "Customer Information Section " and "Account Information Section" fields.on the top of the application . Step 1 : Fill the Customer Information Section. Once you fill the Part A, Enter the Image Numbers as shown in the Image Than Press "Proceed" button and Save the form, A Temporary Customer Reference Number (TCRN) will be generated. Note your TCRN Number for future Reference, you will needed it later to edit the form,if you desire, and to link the customer in the account opening form. Subsequent parts in this steps can be filled only after you have successfully filled Part A. Part A : Type of account and Services Required. Part B : Nomination Form (optional but recommended ). After Successfully filling up of data in the account opening form, as "SMS" notification will be sent to 1st applicant's mobile number along with the TARN . Step 3 : Read the saving Bank Rules. Read these Rules carefully before signing the account opening form. By apply to the Bank for opening the account, you would be confirming that you have read the rules and that you agree to abide by these.A print of the same can also be taken by you after generation of TARN. Require Documents for opening SBI Saving account through online. 2 Recent Passport -size colour photographs. For opening an account, you need to provide the following information. 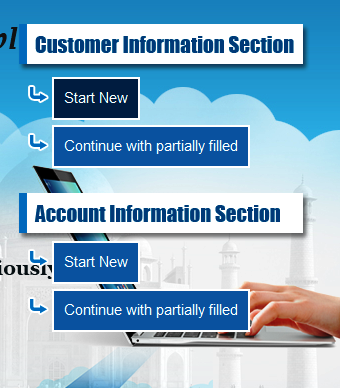 KYC ( Known Your Customer ) information : The acceptable KYC Documents are available through drop down menu in the AOF. Information about the saving account you wish to open and the facilities you would want in the account. Form 60, if you do not have Permanent Account Number (PAN CARD) of income tax. Click here Apply PAN CARD ( Permanent Account Number ) through online . The AOF can be filled at your convenience and fields that you can be validated are checked for error. Time take for opening of the account at the branch will get reduced as the data will already be available in the system. The data will be submitted on a verisign secured site and information will be encrypted before transmission.